・Do not drop or give a shock to a sensor. ・Do not disassemble a sensor or it may be beyond repair. ・Do not expose a sensor to dust or water (waterdrop). 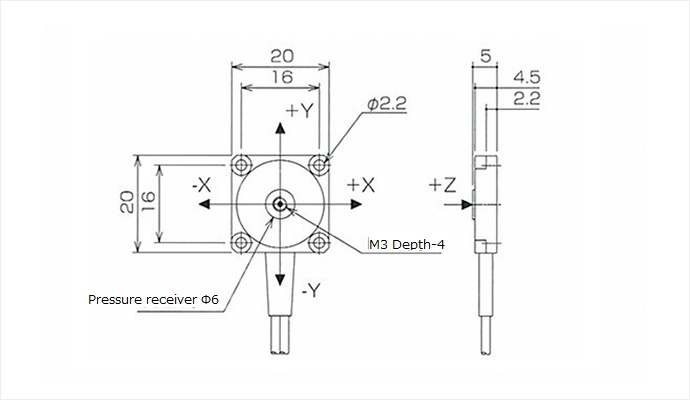 ・Our sensor is designed to detect shear force and three components of force applied to a pressure receiving part. Be careful not to apply rotation or bending moment to a sensor. Note: Use as a rough indication. The sensitivity of a sensor is not guaranteed under the situation where moment can be applied. ・The guaranteed temperature range incluses daily temperature variation. However, be careful not to place a sensor under direct sunlight or it may affect the sensitivity. ・Do not pull, pintch or step on a cable. Do not bend a cable near the sensor body. ・Do not apply excessive load over the allowable load capacity (120% of rated capacity) when mounting. ・Fix four locations with M2 hexagon socket head bolts. An uneven surface affects the characteristic and may cause a breakage. The flatness of 0.01mm or below is recommended for a mounting surface of 20mm x 20mm. ・Use a M3 screw hole at the center of a sensor to fix a specimen. Make sure to use a screw with the length of 4mm or shorter from the pressure receiver surface (Φ6). Using a screw longer than 4.5mm may damage a sensor. Do not overtighten a screw or it may damage a sensor since screwing applies rotation moment. Carefully tighten a M3 screw with appropriate force so that it does not become loose. Connect cables; X: ch.1 Y:ch.2 Z: ch.3. 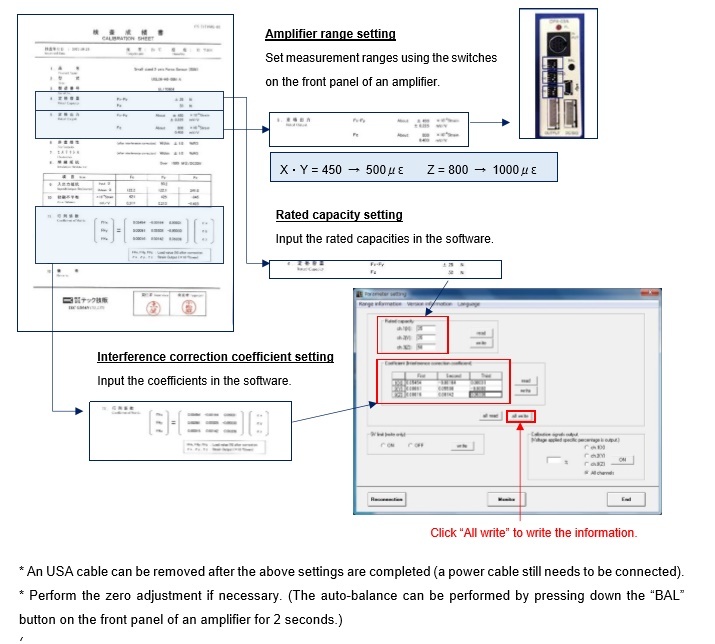 (Connect cables in the same way for following sensors; X: ch.4, Y:ch.5, Z: ch.6….). The below 2 settings are required. Refer to the test report of a sensor. 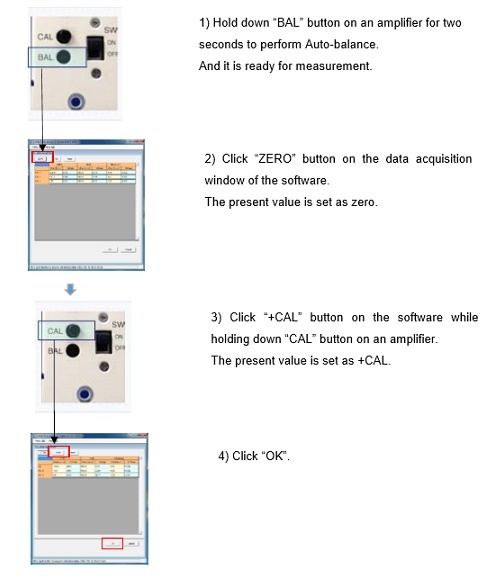 Perform auto-balance (zero-adjustment) and calibration. Install a DPA-03A control software in a computer before the setup. Then connect a DPA-03A and a computer with a USB cable (a driver must be installed when using for the first time). Turn on the power and start the software. 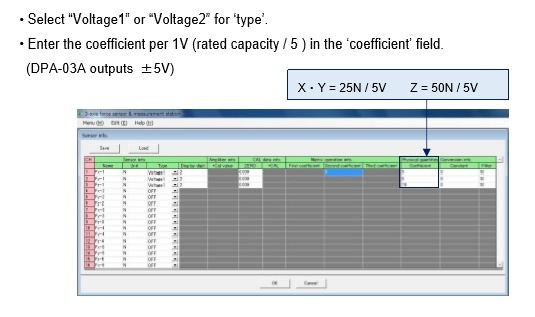 Follow the below steps to set analog output, voltage (V) = sensor rated output. The below settings are required. Refer to the test report of a sensor. When using our DSS300 for measurement software.